Whether you have a large estate or a small estate there are many issues that you should be thinking about if you want your estate handled in a manner that meets with your approval and also that your family is looked after. Depending on the complexity and the size of your estate you may need the services of various professionals. These include a lawyer, a financial adviser, an accountant, and insurance agent or a trust officer. 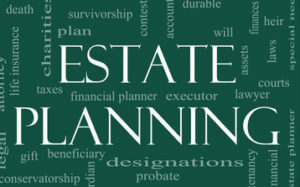 The building blocks to a proper estate plan include. A Will, Trust, Life Insurance, Power of Attorney for Property. In addition Power of Attorney for Personal Care, Living will, Organ Donor Card, Funeral Arrangements, Business Succession Plan, Tax Planning. We will cover each briefly in this post and expand on each in later posts. We have briefly refereed to some of these issues in past posts as well. Will – The core document of your estate plan outlines the executor who will administer your estate. They distribute all of the assets according to your directions In addition they pay your taxes and close up all of your accounts. If there are children involved, they will make arrangements for their guardians. The will is the most important part or your plan. It usually requires the services of a lawyer to ensure that everything is considered and properly laid out as per your instructions. Trust – a trust is set up in situations were you do not want the assets immediately distributed to the beneficiaries after your death. You may also set up a trust to manage assets on behalf of minors. Or other people who cannot manage the assets themselves. The services of a lawyer to set up the legal trust and a trust officer may be required to manage the trust following your guidelines. Life Insurance – is often forgotten about until it is too late. Purchase life insurance while you are young and healthy. Once you have some sort of health issue, it may be too late to purchase health insurance. The life insurance companies may turn you down. Life insurance can provide for your family after you are gone and also pay off debt that you might have accumulated so that your family does not have to deal with it. Power of Attorney for Property – there are two powers of attorney, one for property and one for personal care. The power of attorney provides for a trusted person to mange your assets when you are still alive and are unable to look after them yourself. Choose someone your trust and know that they will do an excellent job for you. There job ends when a person passes away. At that point the executor will take over these duties unless the will makes other provisions. Power of Attorney for Personal Care –This power of attorney provides for a trusted person to make decisions about your personal care in a situation were you are unable to do so. Their role also ends upon death of the person they are responsible for. It is important to select someone you trust and to also indicate what your direction is in terms of how much care you want to receive. Living Will – The living will sets our the direction to your power of attorneys for personal care and for property . The main focus is on personal care. Communicate your wishes in terms of the amount of care to be given if you are very sick , continuing life support and cannot recover. It also provides for someone to also manage your assets while you recover or are unable to make decisions yourself. Organ Donor Card – is an official statement about how you wish your organs to be treated upon death. Whether they can be used to help other people who are badly in need of donor organs. You should discuss this with your family and your doctor. They should know ahead of time and the appropriate steps can be taken. Funeral Arrangements – are often complex and difficult in a stressful and emotional situation. Make your funeral arrangements ahead of time. Communicate your wishes in advance can be a big help to those whose responsibility it will be to make those arrangements. It can also be all about how you wish to be remembered. Business Succession Plan – lays out what will happen to the business that you own in part or in whole. Selling a business or passing it along to your heirs is governed by a complex set of laws. Which can be greatly simplified if there is a well understood business plan in place and understood by the necessary parties. Tax Planning – to minimize both probate taxes and income taxes in Canada. Also estate taxes in other countries should be managed carefully to minimize the taxes your estate will eventually pay. These taxes will be paid out of the assets of your estate. It is important that executors do not distribute all of the asserts are distributed until the taxes are all understood and paid. this is a great start to an estate plan. At least you have listed all of the things a person should really do if they want to do a good job at getting an estate plan together. Now I just have to get off my &)*_) and do it!